If there is one beauty treatment I love, it is a manicure. There is something quite relaxing about having someone else file your nails, sort your cuticles and then paint them without a hint of a smudge, rogue hair or streak in sight. Camden Beauty Spa is a fabulous location if you live in London, close to the tube station it is just a few minutes walk away and they are open seven days per week, open late (till 9.30pm Monday to Saturday and 8pm on Sunday) and to top it off you do not need to make an appointment. You can also take advantage of the online booking service so you don’t need to pick up the phone. It is perfect for on the go, last minute or surprise treat. I went to the Spa for a manicure, though they do offer a lot more treatments which you can find here. I had the classic manicure which comprises of Hand & arm massage, cuticle tidy, shape & Perfect Polish. It lasts for 45 minutes and costs just £21, if you want to add gel polish to your manicure then there is a charge on top. The hardest task for me was choosing a polish, there is a lot to choose from whether you like Essie, OPI or Morgan Taylor. I opted for Essie Carry on which is described as being a deep burgundy purple shade and one I absolutely love. So here are my nails before I entered the salon, not looking at their best and they had been unfiled for a few weeks! 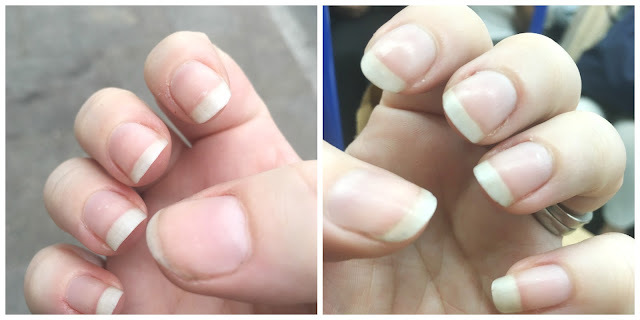 So as part of my manicure, my nails were cleaned, buffed, filed and shaped, which they most definitely needed as it had been some time since I had done them and then my cuticles were softened and pushed back and doing this makes such a difference I feel. I have always been told to never cut to trim the cuticle unless when it is treated, there are bit of skin hanging. All of this I find so incredibly relaxing and sat looking into space whilst my manicurist just got on with the job. Once my nails has been sorted, I was treated to an amazing hand and arm massage where upon which I possibly dosed off for a few minutes because it was so relaxing and I actually forgot about life and stress was eradicated. Once I had been massaged, my nails were then prepped with a base coat, then two coats of Essie before a top coat by Seche Vite and then some cuticle oil and this was the end result. The manicure, considering it wasn't a gel or shellac polish lasts for 10 days without chipping, which is not only the sign of a good quality polish, but a fantastic manicure done by a brilliant Manicurist and I am absolutely thrilled with the result, the shape of my nails and the whole experience. If you are looking to treat yourself, a friend or just fancy some pampering, then I cannot recommend Camden Beauty Spa enough, it is an amazing experience, really close to the tube station and is a hassle free experience. That is such good value for a good manicure, perfect for a pampering treat. What great value for money I love nail polish color you chose. 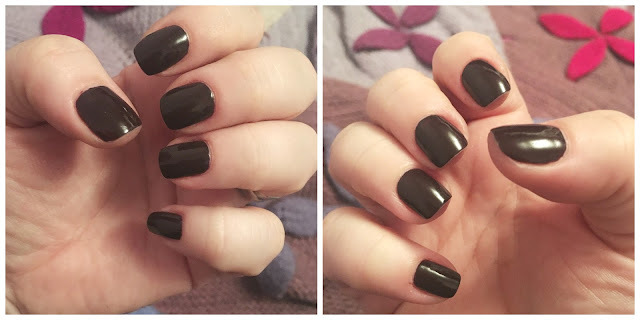 Oh I really need to sort out my nails - I love that dark colour and amazing that it lasted for 10 days too. sounds like an amazing place. I'd love to go someday. Maybe next year when we move back to the UK. Very nice! Like you, a manicure is one of my faves! Seche Vite is my absolute favourite top coat, and I agree a hand and arm massage is so dreamy! the manicure looks soo good! I love the color! They did a great job! My nails could probably be in better shape right now. Your nails looks lovely. You did a very good job. I am not sure I would go for black but I would love to have a manicure - a lovely treat! Your nails look so good. I really need a decent manicure as my nails are a mess at the moment. I love the colour you went for - I need to start doing my nails again! I only ever had a manicure once, in California, and it was rather good fun! Was scared to do anything afterwards to ruin it though! Love the colour you chose. This has given me ideas now, Rachel, it has been ages I have had a manicure, I think it is time I treated myself to one! I love all those Essie nail polishes, you're manicure looks lovely. I need to treat myself to one. Manicure is one of my treats after a full work time. I like the lively colors of polish displayed and of course, your shade choice. Love the colour that you chose. I love getting a manicure, such a treat!